DAYS: Peter says a day is like a thousand years. How can you insist Genesis days are 24 hours? The original question was: If the Apostle Peter said a day is like a thousand years (2 Peter 3:8) how can you be dogmatic about a day being specifically a 24 hour day? We do get asked this often, and sometimes very aggressively, particularly by theistic evolutionists who want the days in Genesis to be anything but 24 hour days. See below for other variations of this question. To answer this question let’s specifically concentrate on Peter’s source for his statement, i.e. Psalm 90:4. The Psalm’s author was Moses, who was associated with the 10 commandments, and therefore Moses was very aware of the statement “In six days God created the heavens and the earth and on the seventh day he rested, therefore six days you will labour and on the seventh day you will rest”. Therefore, Moses above anybody should have had a clear understanding of what the days were, and what the word “day” meant in Psalm 90. The first verse shows the Psalm is addressed to LORD. When we see this in capitals in most English Bibles it is code for the Hebrew name Jehovah or Yahweh. At the end of verse 2 we read “for you are God”. So Moses is not talking to just any god. He is talking about one God in particular and that is Jehovah/Yahweh, the creator God of Genesis 1 and 2. This is the God/LORD who appeared to Moses, inscribed the 10 commandments with His own hand, and then gave them to Moses. Then Moses additionally links the thousand years to an even briefer event, when in verse 5 he likens it to a flood, or cut grass dying. In 2011, in Queensland Australia, we had some massive flooding. What was impressive was the total lack of warning as floods suddenly poured down rivers. We ran a Climate Change program at the time dealing with this flood as a glimpse of the catastrophic events of Noah’s flood. In one dry valley a house was photographed as floods started. At 3.16pm the house was above water and then it was completely underwater at 3:38pm. The flooding of that house took approximately 20 minutes. Note again: we never get asked if to the Lord a thousand years is like a sudden flood (20 minutes) – then surely a day could be over 72,000years long? It is obvious the author is making a point about time using analogies. Moses gets to his point when he abruptly states “Therefore teach us O LORD to number our days for they are so few.” God may be outside of time’s influence but man certainly isn’t. In our world where a day is a maximum of 24 hours, even if you get 70 or 80 years of them, you don’t really have very long on earth. Psalm 90 makes one simple and very obvious point i.e. the Lord God who invented time, is outside of time and not bound by it. It does not affect him in any way shape or form. He invented it. He uses it, and has even planned the end of it, but He is not limited by it. Man on the other hand was created on the sixth day, five days after time was created on Day 1. Man has only ever existed within the time frame of the day/night cycle that was created at the very beginning. NOW to our point. Can we encourage you: Don’t waste the only time you have, it is very limited. Go out there and tell people about the Jesus they need as Saviour and LORD of their lives, and do it now. Unlike God, you don’t have forever. In fact, this may be the last day you have on the planet. The New Testament says “a day is as a thousand years” to God. Why can’t Genesis days be long times? Answer here. Thousands or Millions? Why doesn’t Peter say a day is as a million years to make his point stronger? Answer here. What happened during on the six days of creation? 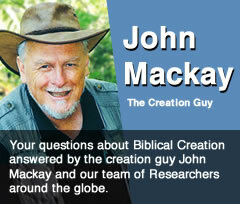 See the Creation Research DVD: Genesis Geology: The six days of creation. Available at the Creation Research webshop. Preview here. For a review of John Lennox’s book Seven Days that Divide the World download PDF here.